Collectors of coins, banknotes, and tokens are invited to join the March 2015 Nuphilex Sale jointly presented by Lower Canada Auctions and online auction marketplace iCollector.com. This auction is up for absentee and live bidding using technology developed by The Live Auction Group and facilitated through iCollector.com. Bidding is available on any PC, Mac, smartphone, or tablet and registration is simple and secure. The auction comes over two days on March 27th and March 31st, 2015 from Quebec. Louis Chevrier of Lower Canada Auctions has put together and attractive sale to appeal to a wide range of collectors. The first day features Canadian coins, tokens, and banknotes with some appealing international varieties mixed in. The second day has a diverse selection of international coins, Canadian proof sets and many more interesting coins. A major highlight in the first session on March 27th, shows on iCollector.com at Lot 132. 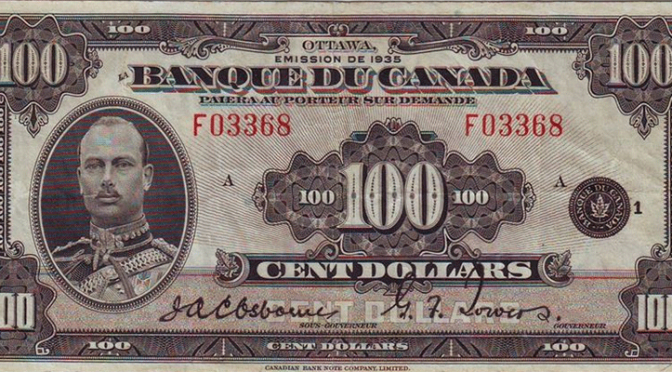 This is a highly sought after Bank of Canada $100 Note from 1935. The details are BC-16, Osborne Towers, and serial number F03368. This banknote is graded as VF-30 and has two high quality photos to inspect the note available in the online catalog. Bidding is opening at $5000 CDN and this note is expected to go for several thousand more. International coin buyers have a great selection to choose from during the March 31st session. An interesting piece comes from Spain at Lot 87. This is 20 reales from 1950 and is a VF coin containing .7607 oz ASW. This piece is a great value piece and will sell to the highest bidder on auction day. Photos for this and all items are available for viewing in the online catalog. Lower Canada Auctions invites collectors to join the March 2015 Nuphilex Sale and register today. Absentee bidding is currently available and live bidding commences at 6:30 PM Eastern Time on both March 27th and 31st, 2015. Registration is easy using an existing iCollector.com account, an email address, or Google Plus and Facebook logins.